Have you ever wanted to visit the Incan Empire? Well, Realtime Gaming (RTG) has given you the chance to do so with their progressive jackpot slot game Spirit of the Inca! Explore ancient temples filled with treasures beyond your wildest dreams. Read on down below to find out why you should be playing this famous 2012 slot game. 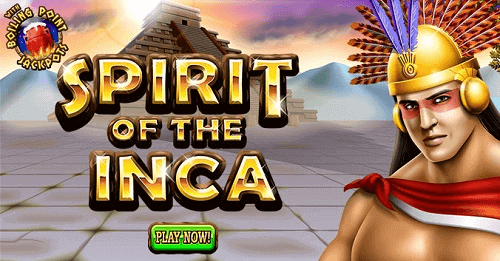 Spirit of the Inca is a five-reel slot game with a total of 25 paylines. It does offer a progressive jackpot. As the name may have already revealed, the game makes use of a classic ancient civilization theme. While some players may be a little tired of such games, there are still real gems to be found in the genre. If visuals and sound design are anything to go by, this title sure does seem to be one of them. The game makes use of only symbols that relate to the theme. Some examples include a scroll, a bag of gems, a vase, a necklace, a golden bangle, a purple flower and a puma statue, among many others. The game does have both a wild and scatter symbol. They are represented by the Incan Spirit and Priestess symbols. The great thing about the wild is that it can even substitute for the scatter! There is one major bonus mode, which is called the Spirit of the Inca feature. Players trigger it when they land the wild symbol on the first and fifth reels. Players will then be made to select five bonus symbols from a possible fifteen. The first three will reveal up to 25 free spins. The fourth will reveal a multiplier whereas the fifth has the chance of awarding players extra wilds. All of this creates an opportunity to win some absolutely massive prizes. Spirit of the Inca is a fine addition to the RTG collection. While the theme isn’t all that exciting, this game is a load of fun and real money prizes galore in this game. We truly enjoyed our time with it, which is why we are awarding it four out of five stars.